Echeveria nodulosa, commonly know as Painted Echeveria, is a fascinating, evergreen succulent with up to 2 feet (60 cm) long, branched stems that lie over horizontally or arch slightly upward bearing up to 5 inches (12.5 cm) wide rosettes of absinthe-green, pointed leaves that are slightly concave above and keeled below and are vividly marked with red on the margins and mid leaf. In summer appear the pale yellow flowers marked with red on an up to 2 feet (60 cm) tall, erect and unbranched inflorescence. The bracts have a coloring similar to the leaves. Perfect plant for rock gardens and containers where spectacular floral arrangements can be created. Painted Echeveria comes from a wide range within central Mexico (Oaxaca to Puebla) where it typically grows on dry limestone hills. 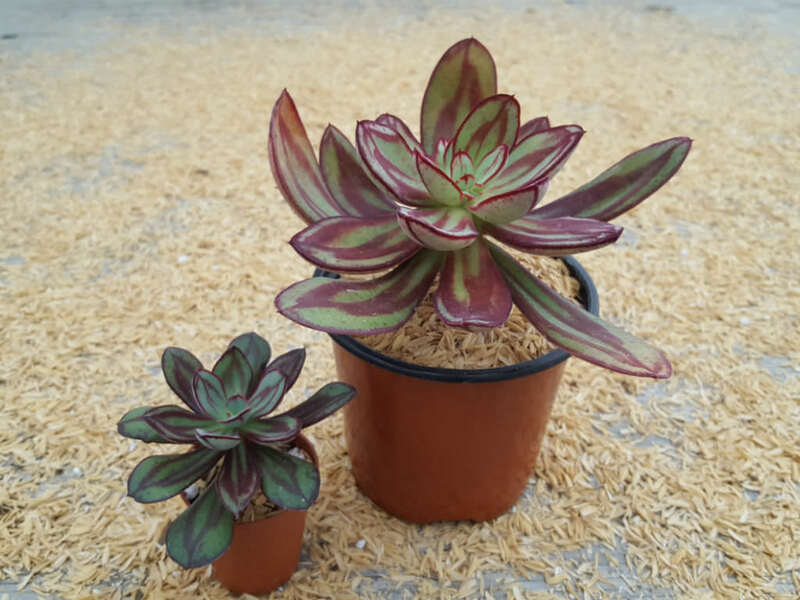 Painted Echeveria is easily grown in well-drained soil in sun or partial shade. Indoors, provide bright light. If you are moving your plants outside in the spring, do it gradually. A couple hours in morning sun, then a few more, until they are in full sun. Best in partial shade in hot summer areas. If grown in a container, it will grow as large as the container allows. Once established, Painted Echeveria requires occasional watering during the hot season. The time between watering depends on the temperatures and conditions of the plant. Reduce water in the winter to monthly. Feed with a controlled-release fertilizer in the beginning of the season or weekly with a weak liquid solution. Use a balanced 20-20-20 fertilizer at 1/4 strength on mature plants, and a fertilizer with less nitrogen on young plants. Virtually disease free. Watch for mealybugs, vine weevil and aphids. Repot as needed, preferably during the warm season. To repot Painted Echeveria, make sure the soil is dry before repotting. Propagate Painted Echeveria from stem cuttings when you trim back the top growth. Roots easily from stem or leaf cuttings. Divide clumps every 2 to 3 years in early spring.